XXXHOLiC #15 has been officially released today in Japan and along with it, the limited edition that comes with the OAD of XXXHOLiC Shunmuki Part 2. Today the official website of the Tsubasa and XXXHOLiC OADs updated to announce the production of a brand new OAD for XXXHOLiC. The new installment will be released with the limited edition of XXXHOLiC #16. PRODUCTION I.G and Tsutomu Mizushima (director) will remain in the staff. The release date is still undecided. 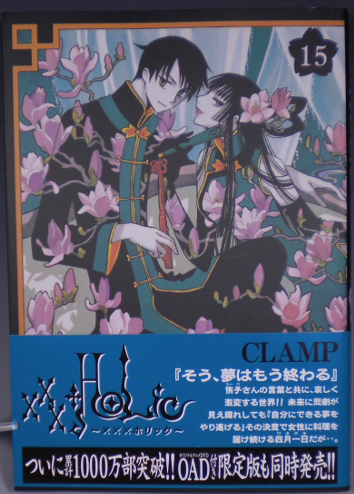 The obi strip that comes with XXXHOLiC #15, apart from announcing the OAD sequel, it reveals that the XXXHOLiC comics have sold so far over 10 million copies. More details about the OAD will be given in due course. Stay tuned! What about Tsubasa? Is Ohkawa involved at all? Too bad for you though, I’m really sorry and I hope it was just a mistake. Sorry to hear about your cancellation. Order from HMV Japan. They still have stock, and you don’t have to pay a 2,700 yen handling rate + 300 yen per item fee. The shipping will still be expensive though. HMV let me know they’re shipping all four limited editions to me and the shipping costs to America is 4,700 yen!! All the books weighed 2.2kg, so one set might be about 600 grams. According to EMS’s website, that’s about 1,680 yen to ship to America. Annnnd my day is now ~fabulous~. CLAMP, all these OADs make up for holding out on xxxHolic for weeks on end. I hope they go more all out on budget like the first xxxHolic movie. i would be excited but i smell final arc and Yuuko’s death which i AM NOT EXCEPTING! I wished for something like this to happen!!!Woohoo!!! new oad from holic? YAAAAAY! that is always a good news! likw always thanks for the news chibiyuuto-san! That’s really a good news! Thanks for the news! thaanks for the news and we must wait for the raw !! OMG!! This is an amazing news! But why OAD? They should do OVAs and link it with another Tsubasa OVAs in Cut-off Clow Country! OAD is the term for an series released originally on a DVD in Japan, in America the term “OVA” is still used for these series, so they mean the same sort of thing in this case. In Japan their version of “OVA” is exclusively for VHS. Faah. Win win win. Quick announcement. Very unexpected but congrats to holic! Clone Syaoran (with Fai’s right eye) looked so hot in xxxHOLiC Shunmuki OAD Part 2!! Wait, does this means that Holic will have another volume? When are the series going to end, then? I thought they’d be over by August at most.